Slow Dazzle Worldwide, here in the UK, presents the Rocky Horror Official Calendar Two Thousand & Six "Featuring the legendary photographs of Mick Rock". This years Calendar is presented in the same fashion as previous years. Once again it is a 30cm x 30cm (12" x 12") page folding out to show the main image as the top half of a double page (60cm x 30cm), with the calendar section below. The calendar is also punched with a small hole to hang it on a nail. As well as the main image there are bonus small images on each page, some repeated from main images, some as seen on previous calendars. In addition each page also has an image of Janet from the Floorshow scene repeated on each page. The center spread this year features ten colour images at 9cm x 9cm with a nice shot of Frank with Brad and Janet just before he throws his drink at 18cm x 18cm. Dave's Fave this time around is the head shot of Riff against the black velvet background. Again it's very nice to see that Slow Dazzle will be donating a portion of the proceeds of each sale to Manchester Children's Hospital on behalf of Richard O'Brien. For the fourth year in a row, Slow Dazzle have produced the Official Rocky Horror calendar, "featuring the legendary photographs of Mick Rock", and it's another beauty. I remember when there only used to be a new Rocky Horror calendar every few years or so, so it's extremely exciting to look forward to a new one appearing every Autumn at the moment. The only disappointment is that many of the photos used this time round were actually seen before on the 2004 calendar, and I desperately hope that this is not an indication of what the future holds for these highly anticipated annual collectables; November's pool scene, for instance, is merely a flipped photo of the September 2004 shot (like we wouldn't notice). 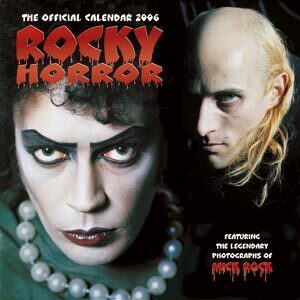 This is a real shame, as the publicity blurb for Mick Rock's upcoming Rocky Horror book promises 272 pages and approximately 300 photographs, so he must have an enormous catalogue of beautiful pictures we haven't yet seen, without having to recycle the same shots for the latest calendar. Of course this does not mean that the photos themselves are not gorgeous, and well worth seeing again. Mick Rock took some incredible photographs during the production of The Rocky Horror Picture Show (and also some of the early Rocky stage productions, which I'd like to see more of), and these calendars are a terrific way of presenting them. My favourite shots this time include March and August (both previously seen on the 2004 calendar); January's space Riff and Magenta picture; and the fabulous Frank image for October (Happy Hallowe'en everyone). Plus, the fact that a portion of the proceeds from the sale of each calendar goes to Richard O'Brien's chosen charity at the Manchester Children's Hospital is an extra incentive to keep producing them every year. The layout and overall presention for 2006 is once again stunning. All of the Slow Dazzle/Mick Rock offerings have been superior to the older Rocky Horror calendars, and, although the inclusion of so many previously used photographs does seem a little lazy, the latest edition still provides us with a dozen beautiful Rocky images to see us through another year, while serving as a tasty hors d'oeuvre for the forthcoming book. All images copyright Mick Rock/Slowdazzle 2005. Used for purpose of this review only and may not be copied or used on other sites.